This project is the first one that I loved as soon as I dreamed it in my mind. I loved it as I made all the tops. 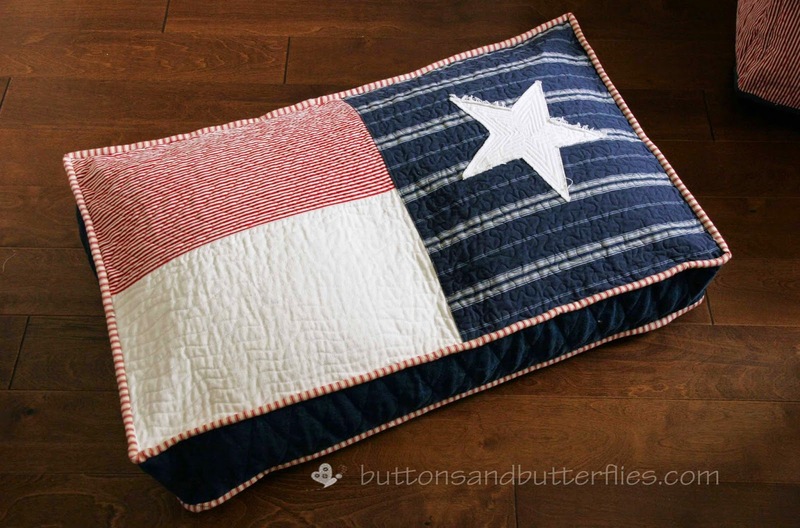 I loved it as I was quilting it. I loved it while I was constructing it. I loved it when they were all finished. RARELY ever happens to me. I usually hit a bump in the road at some point! 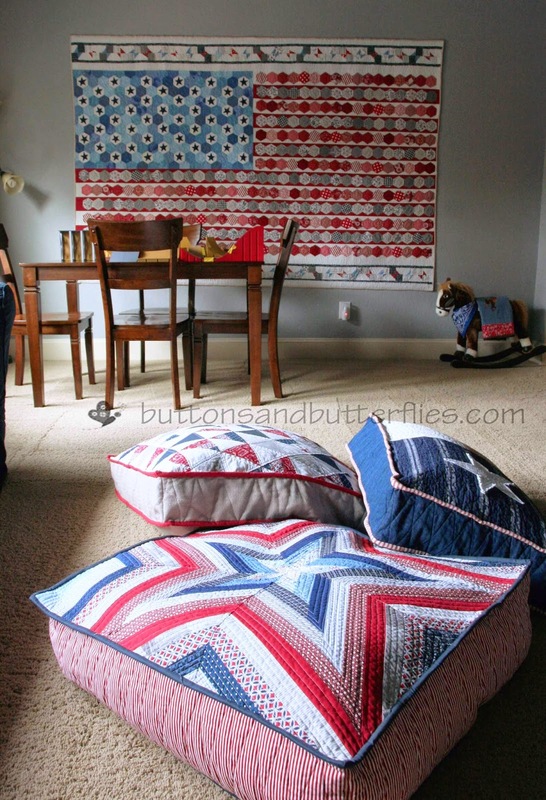 I envisioned these quilted bean bag floor cushions to complement the Stars and Stripes Quilt I made for the boys' game room last year. Want to hear the BEST part? Entirely made of scraps and stash!! The first cushion was in honor of our home the last 11 years. 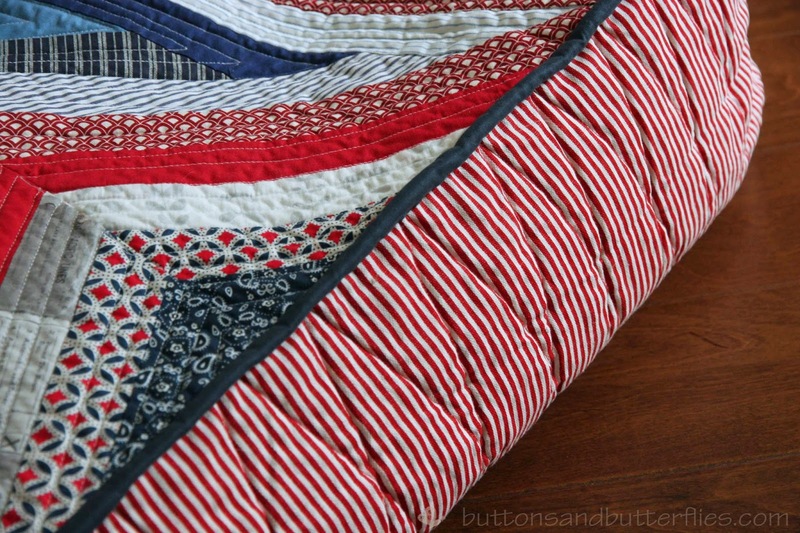 I thought it was perfect considering the large quilt is the US quilt! I used heavy home dec fabrics and denim from old projects. 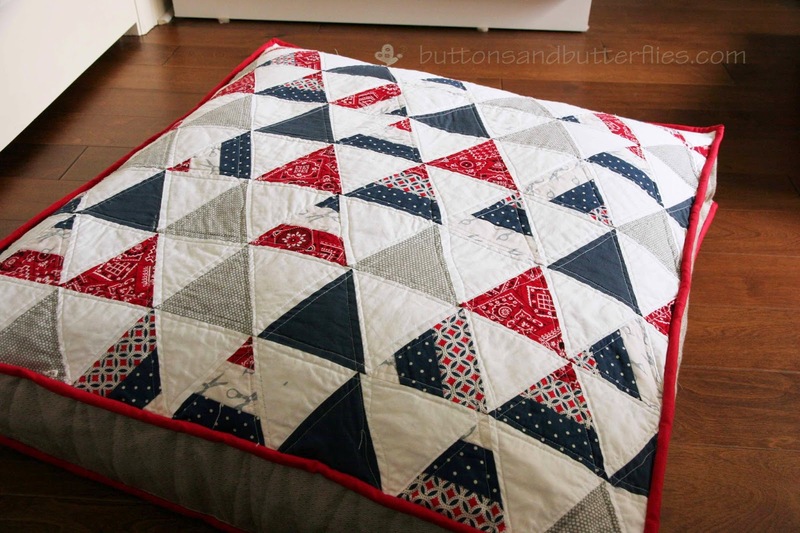 Because the piecing was actually rather simple and boring, I tried to have fun on my longarm with the quilting. On the red, I played with my 90 degree angle ruler and made various sized chevrons. I wanted to play with movement. 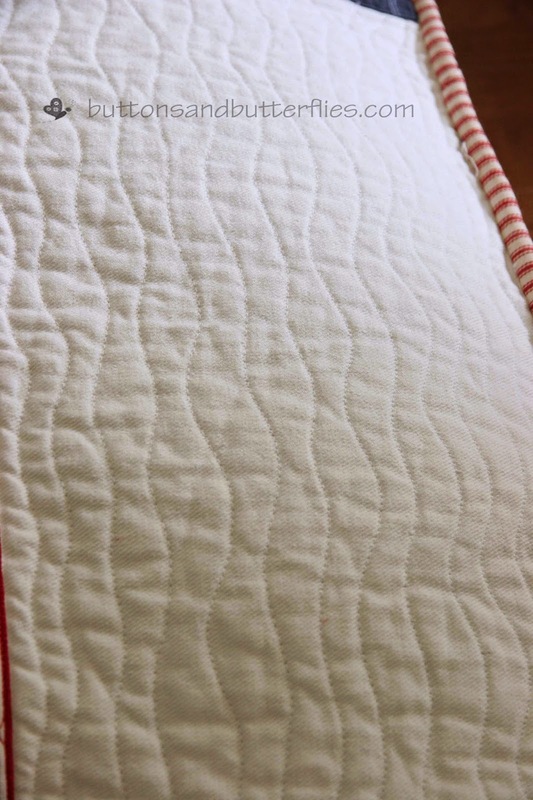 On the white, I just free motion quilted squiggly lines. Meandering in the blue stripe and tiny echoes on the raw appliqué denim star. I didn't pick up the needle and just kept spiraling into the center. 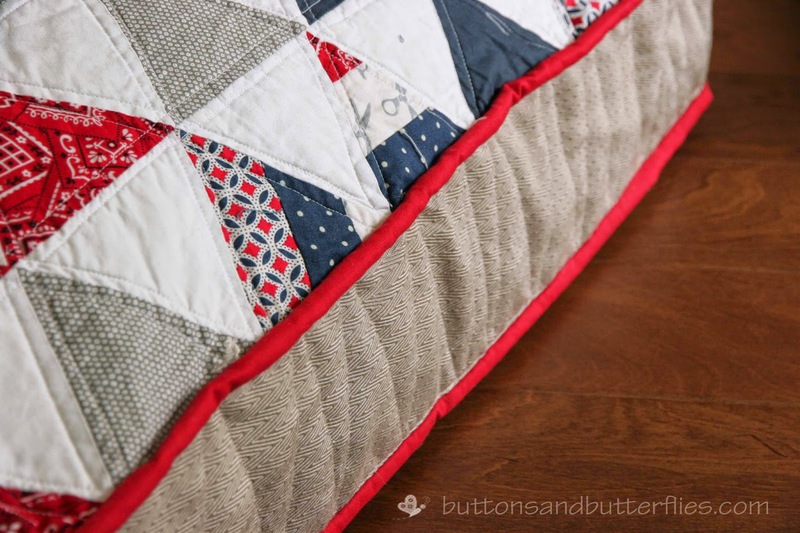 Diamond Quilting on the denim sides. 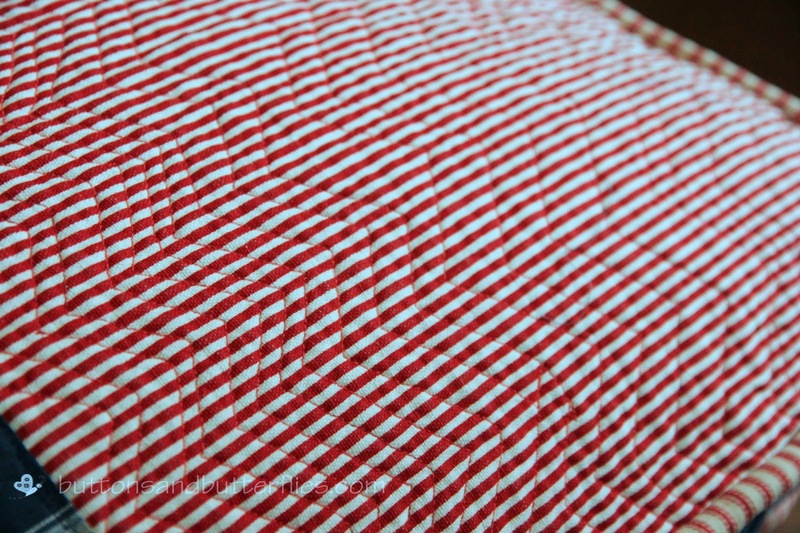 Do you just love the white and red ticking as the binding as much as I do? All three cushions are constructed the same. 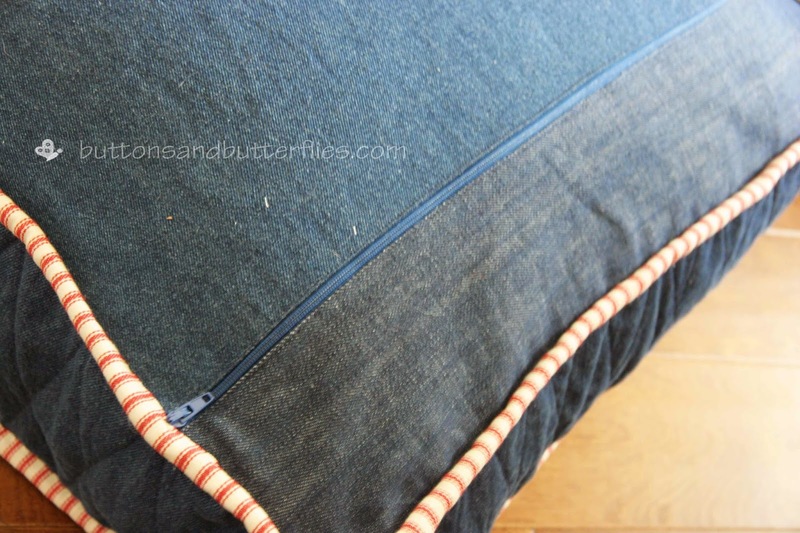 The bottoms are heavy home dec material or denim with a zipper a few inches away from one side. I decided to treat the entire cushion like a quilt. 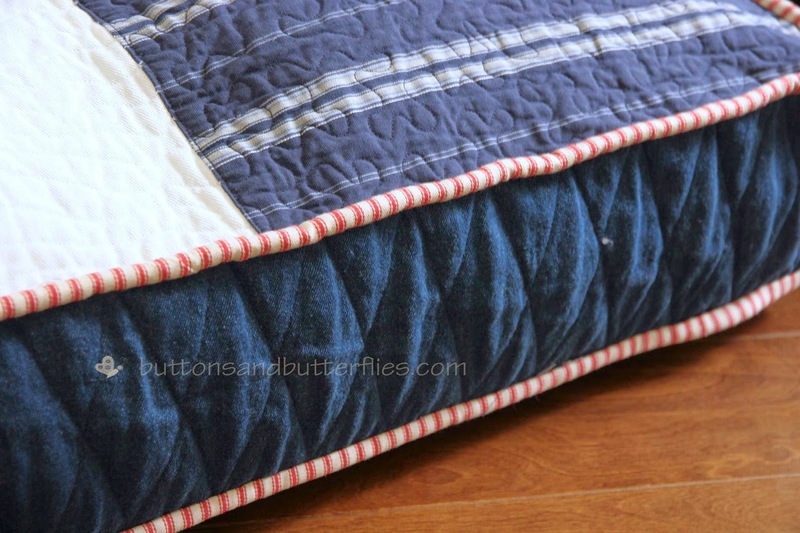 I quilted all the parts and washed them before sewing the sides to the top and bottom. I decided to do a binding instead of piping so I didn't have to turn a lot of bulk, inside-out. Inside, I made an entire lining in the same size to hold the bean bags with some old sheets. That way, I can wash the cushion shell. Boys are dirty, after all! The second cushion was leftover strips from other projects and stash. I pieced a few of the strips and then cut 60 degree angles to make the triangles. I added the gray to break up all the red, white and blue. It seemed to beg for the solid red binding for some pop. The cushion sides were a home dec fabric that just didn't work out for my bedroom window treatments. Waste not, want not. The third cushion? Last, but certainly not least. Actually? My FAVORITE! 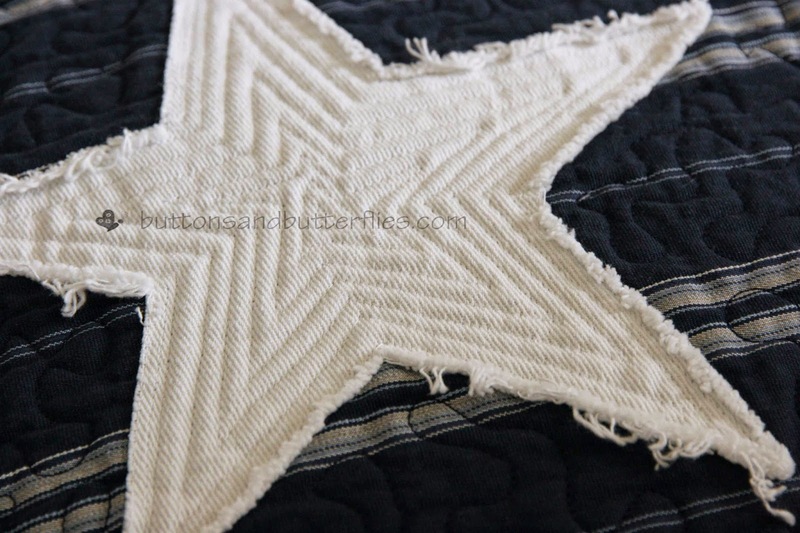 This five point star was so fun to make. I was very random with my scraps and stash and I just love how it turned out! 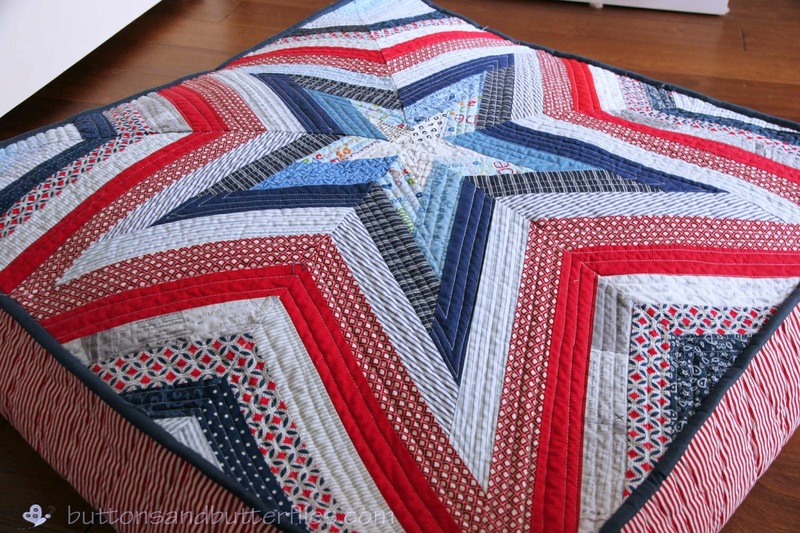 I love the straight line star quilting. It crinkled so beautifully! Another home dec red stripe fabric for the sides and a solid blue binding. I did not want to take away from the top! Wow! These pillows are absolutely fabulous!! I love all of them!! They are so perfect! Repeat of above! WOW! Your pillows are perfectly gorgeous!! I'm in love with all of them!! I tried to say something else but these are exactly my sentiments!! I truly do love them all including the quilt on the wall!! Yes, you're right they are perfect!!! So pretty, you did an excellent job! I'm so glad I got to see them! 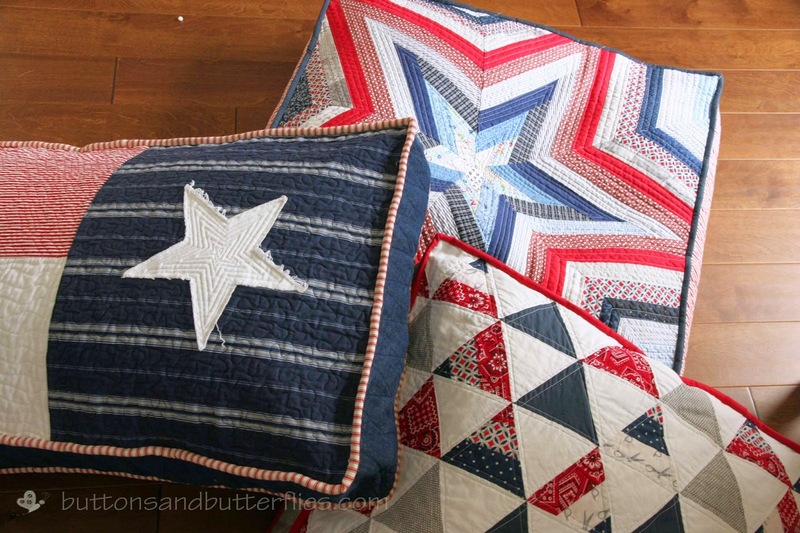 I love ALL of them (though I do agree that the star pillow is really stunning) - super work! You've done a fantastic job of them all. i just love all the designed bean bags.